An active learning space at Dawson College in Canada has taken interactive display tech to the extreme. The classroom walls boast 56 feet of digital workspace where students can collaborate on coursework. The room is outfitted with eight Nureva Walls from Nureva, a Calgary-based maker of visual collaboration and audio conferencing technologies. The interactive displays, along with Nureva's Span collaboration software, allow students to "view, interact with and share large amounts of information at the digital wall or from their smartphones, laptops or tablets," according to a news announcement. The display systems are configured as one triple Nureva Wall (creating a 21-foot-wide workspace), two dual walls (each 14 feet wide) and one single wall (7 feet wide). 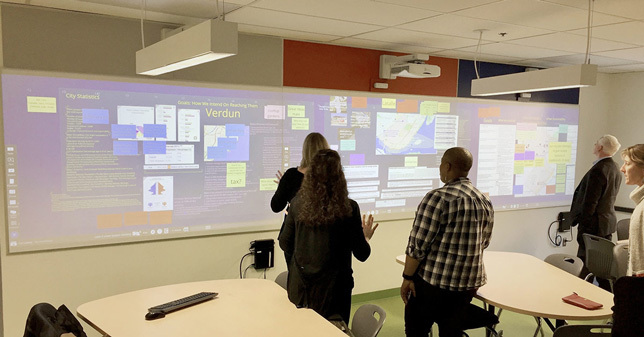 "When the Nureva Walls are linked, it feels very immersive, because you're in one continuous space," commented Elizabeth Charles, educational technology researcher and co-coordinator of the active learning classroom, in a statement. "How students might react to the linked canvas on multiple surfaces is a new experience, so we will be exploring that in a research project to learn how it helps people who are working collaboratively."